A brace from Will Evans against his former club earned Chesterfield a valuable three points away to fellow strugglers Aldershot Town on Saturday. 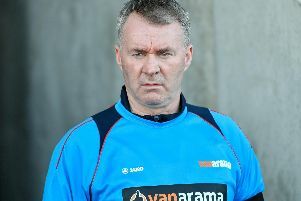 The win will not move John Sheridan’s men out of the National League relegation zone but it will have given them a confidence boost ahead of next week’s game at home to Barrow. The first chance of the game went the way of the home team after nine minutes when recent addition from Barnsley and former Spireites trialist, Gerry McDonagh, muscled his way through the Spireites’ defence before shooting well over Shwan Jalal’s goal. After struggling to mount a meaningful attack in the opening stages, the visitors had a good chance to take the lead after 23 minutes when Lee Shaw’s cross found Jonathan Smith inside the box, but his shot was comfortably saved by keeper Will Mannion. With little more than a minute of the half to play, Chesterfield did find a breakthrough when former Evans rose well to head home Curtis Weston’s corner. After being second-best for the majority of the first half, the Spireites took a slim advantage into the break and started the second half a lot brighter with Smirh having a shot blocked on the line by legs of Mannion. With 50 minutes on the clock, a run into the box by Bradley Barry almost produced a goal, Mannion tipping the defender’s powerful strike from 25 yards round the post. In the final 20 minutes, the home team came back into the game but Jalal was equal to a stinging strike from new signing John Goddard from the edge of the box. But with 78 minutes gone, Chesterfield wrapped up the points when centre-back Evans scored his second of the game, firing home from inside the box after Marc-Antoine Fortune’s shot was parried by Mannion. Chesterfield nearly scored a third in added time but while Kyel Reid's effort beat Mannion, it was blocked on the line by Jake Gallagher before being cleared by Regan Booty. Aldershot Town: Mannion, McDonnell (McClure, 83), Howell (Grant, 64), Wanadio, Bernard, Gallagher, Booty, McCoy (Lelan, 81), McDonagh, Finney, Goddard. Unused sub: Bozier. Chesterfield: Jalal, Barry (Rowley, 88), Binnom-Williams, Evans, Weston, Shaw, Weir, Hollis, Smith, Fortune (Denton, 86), Kiwomya (Reid, 78). Unused subs: Anyon, Beestin.